The exposé on the other attempts to shut down the GOP Convention in Cleveland should be focusing on the avowed communist groups organizing the events. It should be focusing on the dehumanizing rhetoric used to embolden the red terrorists’ attempts to silence and intimidate the delegates and MAGA patriots attending the convention. But something more extreme and serious has come to the attention to the Lion Guard that requires immediate attention. According to a recent press release, the New Black Panther Party, intends to be armed and present at the RNC convention this year. In the most laughable piece of projection, the party’s chairman said, ” we will exercise our Second Amendment rights because there are other groups threatening to be there that are threatening to do harm to us.” Omitted from his remarks are the comments by the party’s leader, King Shamir Shabazz, that called for the bombing of white churches and the murder of white newborns. By all measures, the New Black Panther Party is a violent afro-chauvanist group that calls for overt attacks on non-black Americans. It’s positions are considered so extreme, even the left wing think thank, the Southern Poverty Law Center, deemed them a “hate group”. The party also maintains the Huey P. Newton gun club, the militant wing of the party that works to create an all black, secessionist, army. Indeed, the so-called defense minister of the party and co-founder of the Huey P. Newton Gun club lauded the Dallas massacre. This is not the first armed protest by this group or the first time threats were showered upon a COP Convention. In 2012, members made vulgar threats against the Republican party, stating “our feet will be on your f***ing necks”. While the threats never materialized into actual action, in the four years since the Tampa convention, the steady flow of yellow jounalism, political pandering, and anti-American agitprop, has created a tense environment that has lead to both the San Diego lynch mob and the Dallas Massacre. As the political rhetoric used amongst neo-bolsheviks has devolved into calling Mr. Trump and MAGA patriots hate-filled, racists, and fascist, the dehumanization process has reached a frenzied peak. Moreover, these rabid marxists are already planting a narrative that MAGA patriots will instigate the violence, as quoted in this aforementioned article, agitator Terrea Mitchell dog-whistled to her fellow red terrorists to exploit Ohio’s open carry laws “There are racist, fascist and white supremacist groups that will be descending upon Cleveland . . . to incite violence.” The New Black Panther Party has merely taken her up on the suggestion. At this point, it is so important for each of you reading this please help the Lion Guard scour social media for threats to attach the GOP convention, convention goers, or Mr. Trump. The “protestors” will not be armed only with fists and raw eggs, they will be packing heat and manipulating Ohio’s open carry laws to terrorize all convention goers. The only hope to deter and stop their plans is to expose them and show them in advance. With your help the Lion Guard can put law enforcement and other security forces on notice about those neo-bolsheviks and their plans to physically harm the convention goers and Mr. Trump. Originally, this post was to be an exposé on the violent neo-bolshevik groups plotting to attack the Republican National Convention, but in light of certain development, that will be postponed. The reason for the postponement is that during the investigation into the plans to block the RNC, a plan to shut down Mr. Trump rally in Raleigh, NC, tomorrow was discovered. 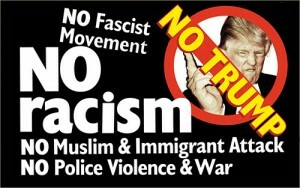 The event was organized by a group called NC Anti-Fascist. The group also organized an event for tomorrow to “Tell Hillary and Obama to stop deporting illegal immigrants.” The event to silence Trump had 23 red thugs pledge to attend, the event to plea with Crooked Hillary had 6 RSVP’s. The disparity in both the language used and the enthusiasm of members for each event shows the hypocrisy of the “Anti-Fascist” mindset and its relationship with the Democrat Party. “Anti-Fascists” also known as antifa, anti-fascist action or AFA, but their name does tell a great deal about their ideology and motivations. The name “Anti-Fascist” is a camouflage for their true world view, which if known to the average American, would lead to a unanimous repudiation of the “anti-fascists” and the politicians that give them any patronage. The name “anti-fascist” tells the public what they are against and as propaganda, it’s a good brand name; what red blooded American wants fascism; didn’t the Greatest Generation fight to destroy fascism? Indeed, it seems axiomatic that to be American is to be against fascism. However, no group can be defined by what is opposes, but only what it supports. Looking at the ideal polity for the “anti-fascist” it becomes obvious they are pro-marxist. They, of course, will deny this and use dozens of adjectives to described their world-views, but regardless of the twenty dollar words they use to describe themselves, they have common elements: erasing all national borders, anti-theism, anti-capitalism, and commune based social structures, the very same things for which Karl Marx advocated. They can deny their pro-marxist views, but if it looks like a duck, walks like a duck, and talks like a duck, it’s a Marxist. While they do try to conceal their Marxist leanings from the public, they rarely take offense to it when exposed. It is unsurprising in this day and age when the atrocities of the marxist regimes are forgotten or brushed away as not real communism. However, when we see the barbarity these Pro-Marxists are willing to and already have unleashed upon Trump supporters in such places like San Jose and Albuquerque; we see the inspiration for this violence in Mao’s Red Guards who would hunt down “politically incorrect” people and conduct “struggle sessions” which is a euphemism for lynch mob. We also see it in the dehumanizing propaganda issued by the Pro-Marxists in that it mimics the rationales espoused by Lenin’s Checka to implement a campaign of terror against the Russian paesantry: Trump supporters are not sufficiently revolutionary and they need to be subjected to violence until they become satisfactory. We must never forget they Marxism is a politics of violence and mass murder; these “anti-fascists” are inspired by and seek to reenact the bloodiest episodes of Red Terror against those they libel as “fascist”. Understanding that antifascist is just code for proMarxist, the motivation for these groups of neo-Bolsheviks to “shut down” Mr. Trump for his anti-illegal immigration views, while they merely plea with Ms. Clinton for substantially similar ones becomes more clear. Ms. Clinton is, in the proMarxist view, a Fabian Socialist; that is, someone who wants to gradually implement communism and its destruction of the nation state, religion, and private property. Mr. Trump is by all accounts, not a socialist by means; he is, in his own words, a nationalist. His opinions and proposals over the past 35 years bolster this claim, from his concerns about the US military and Trade in the 1980s to his proposals during the 2000 presidential campaign to the present all can be summed up in the phrase “America First.” To the proMarxist thugs, Ms. Clinton is a step in the right direction for their purposes, while Mr. Trump is a step backwards. As a consequence to the Trotskyte terrorists, Ms. Clinton just needs to be convinced to speed up the Sovietization of America, while Mr. Trump must be stopped at all costs because they know his presidency could be a mortal blow to their plans. If you are reading this, this is a call to action, if you see any threats online to attack, disrupt or otherwise harm Mr. Trump, any attendees at the event, supporters outside the event, or the event itself DON’T IGNORE IT! Share the info with Lion Guard on Social Media on facebook or on twitter using the hashtag #LionGuard. If you know any persons that plan to go to the event or show their support outside it, tell them about any threats you see and to check the Lion Guard for threats others have exposed. If you discover any threat to use deadly force at the Manchester event, contact the Manchester police ASAP. You are the Lion Guard; your efforts and participation will Make America Safe Again! If you want to organize an in person group to attend Trump events and point out known threats to event security and law enforcement, it is more complicated. To prevent the neo-bolsheviks from attacking or harassing Lion Guard participants, there are no mailing lists or persons in charge per se. However, if you want to organize with fellow MAGA patriots in your area before a Trump event, you can use the Lion Guard facebook page to reach out to each other or, you can create your own local chapter using any means you think are reasonable to gather Trump supporters in your local area. If you would like for the Lion Guard to promote your local chapter, please contact us by either leaving a comment with your chapter location, and the contact info for your chapter, as well as the name of your chapter leader. The last request may seem invasive, however, it is for quality assurance and to prevent sabotage. Some people do not know how to make a report to the Lion Guard of an online threat. Making a report is rather easy and after the first 2-3 attempts you will likely become very proficient. For this guide, it will be assumed you have discovered a threat. First, copy the hyper link of the threat. Second, archive that link. You can do this with such websites like archive.is or archive.org; if you want to save the link to a tweet, there is the specialized tweetsave.com archive website. Third save an image of the threat; while not absolutely necessary, it makes the threat more easily accessible to other Lion Guard participants. Lastly, if you can get a profile picture of the threat maker, you should save an image of that person as well. Once you have all the threat info archived and imaged, you need to upload it to Lion Guard for others to see. Now you can post it on the Lion Guard facebook page; tweet it to the Lion Guard twitter; join our group on oopih.com, !LionGuard. Also you can share it as a comment on lionsoftrump.net but it will require uploading any images to imgur.com and then posting the imgur link(s) in your comment, along with the archive link. By taking these simple steps you are giving fellow Lion Guard participants the necessary info to identify threats at the Trump rally. Once they see the person you identified, along with their admission to cause harm at the Trump rally; the Lion Guard participant at the rally can point the person out to event security and have them escorted out, to allow for a safe and peaceful rally experience. In seven days the purpose of Decision 2016 has changed from a mere struggle to Make America Great Again into a duty to make the world sane again. The past week has revealed one singular conclusion, the politically correct mindset that dominates cultural, economic, social and political institutions must be disposed. It has raised a generation of political hooligans that used distorted language to make their vile goals seem noble. It has installed a political order rife with indifference to the law and order it is charged to uphold. It is fomenting a small, vicious, clique determined to turmoil if America does not submit to their unrealistic demands. Decision 2016 is a referendum on political correctness. A week is not a great deal of time; it is less than two percent of a year, a mere seven days of the 366 days this year shall have. But this week has seen several monumental events that illustrate the depth and breadth of the politically correct mindset in America and throughout western civilization. On Saturday, March 19, the anti-MAGA horde shut down the Fountain Hill, Arizona, by closing all roads into the city. As the epitome of anti-Americans, they did not act to stop the Mexican government from sending colonists to the United States, or demand American Corporations stop betraying their native country with outsourcing and visa abuse. Rather, they brought an American city to a grinding halt to silence the one candidate with a platform to stop the colonization and the corporate treason, Donald J. Trump. While the attempt to silence Mr. Trump developed into mere inconvenience for the MAGA patriots heading to the rally, the anti-MAGA forces did not quit. In Tuscon they set up a gauntlet to harass and attack every Trump supporter seeking to attend the rally. These intimidation tactics were unavailing and the rally went on as planned, but the patience of MAGA patriots was tested by the slander and invective spewed by these persons intent on ending American sovereignty.While MAGA patriots were under attack in Arizona, another swarm of rootless barbarians sought to raise chaos in New York City, and shut down Manhattan from Columbus Circle to Trump Tower. While the horde ground mid-town Manhattan to a standstill, the organizers of the event, members of the NY Cosmos football club bragged the mainstream media advanced their cause by concealing the disorder caused by the “Cosmopolitan Anti-Fascist” march that quickly devolved into violent confrontations between police and neo-Spartacists, a group of militant communists that advocate a violent global revolution to establish their Trotskyite utopia. In one day, political correct marauders brought two cities to a halt, yet, the mainstream media tried to blame Trump for the rowdy actions by the very people who wish for him and his supporters to be silenced. The events of Saturday, March 19, were horrible and aggravating for many MAGA patriots, but what transpired the following Tuesday was a tragedy for the entire world. On Tuesday, March 22, members of the Islamic death cult, ISIS, detonated multiple bombs in Brussels, Belgium killing 31 instantly and maiming hundreds more in the name of their global Jihad to impose Islamic law and Islamic religion on all people and all nations. Several of the terrorists involved in the attack were known to Belgian authorities as militant Islamists, yet they were able to plan and execute the largest attack on that small country since World War 2. More confounding is the politically correct efforts to deny the porous borders of the European Union had a role in this vicious attack. They focus on the national passports of the terrorists and not on the fact they, like the Paris attackers, were able to travel from Europe to ISIS training camps in the Levant by blending into the thousands of other military aged men entering Europe on dubious legal grounds. Even if the politically correct argument against secured borders is taken on its merits, they ignore these terrorists find refuge in the multiple neighborhoods that are practically outside the jurisdiction of domestic law enforcement. The planning center for both the Paris and Brussels attacks was the Brussels suburb, Molenbeek, a no-go zone where gangsters rule and other sources of order are attacked with extreme prejudice. As of the day before the Brussels attack, the Belgian government knew of at least 85 ISIS terrorists in that one neighborhood, but these war criminals were not brought to justice for fear of inciting Molenbeek’s Islamo-Mafia to violence. Regardless of the terrorists’ origin, the Brussels attack has revealed political correctness is enabling these Islamic death cultists with delusions that appeasement dressed up as tolerance will make them peaceful. The tolerance of violent terrorism by the politically correct should not be surprising. As discovered, by the Lion Guard, some of the most vociferous people against Mr. Trump’s campaign to Make America Great Again have begun to make violent contingency plans in the event Donald Trump is elected. Calling itself the White Rose Society and the White Rose Revolt, these people have pledged to engage in incremental violence to suppress any effort to Make America Great Again. They are currently organizing chapters throughout the United States based on one single principle, the American nation, people and culture must be destroyed to promote their globalist agenda. All around the our country the forces of treason and destruction are forming their ranks to stop the MAGA patriots because Mr. Trump has put into words what every patriotic American knows, the charlatans espousing political correctness will kill us if they cannot have their way. Donald Trump has struck upon a nerve that runs through both factions of the political establishment. Against an elite that sees national borders and culture as obstacles to their machinations, Mr. Trump stands for preserving American sovereignty and identity. Against an elite that sees guest worker programs as a means to fatten their bottom lines, Mr. Trump understands many companies are abusing these programs to the detriment of the American people. Against elites that engorge themselves on profits from off-shoring and out-sourcing, Mr. Trump demands an ends to global commerce based on currency and treaty manipulation. Against elites that are indifferent or even seek to profit from the infiltration by ISIS cultist into the USA, Mr. Trump advocates for the security of the American public against these wolves in sheep’s clothing that howl Paris and Brussels are only a foretaste of what they plan to visit upon the USA. Against the useful idiots of the elites, hypnotized by their delusions of utopia, Mr. Trump presents a vision for America based in sovereignty, security, prosperity, but most importantly, reality. In one week, the 2016 presidential race transformed from a debate about the future of America into a decision about the future of civilization. In one week the public have seen the desperate lengths the politically correct will go to silence and intimidate opposition their plans to dissolve America. In one week the public have seen the indolent folly that infects the politically correct mind. In one week the facade of politically correct “love” and “peace” has broken away to reveal an ugly truth of hate and violence that underpins the anti-MAGA fanatics. In one week those people that attack Mr. Trump, his supporters and their rallies have revealed they lack the moral authority to decide the future of these United States. But this week also showed who has the vision to Make America Great Again and it is the duty of every MAGA patriot to stand up and take the lead. Our country depends on US!